Despite the significance of marine habitat-forming organisms, little is known about their large-scale distribution and abundance in deeper waters, where they are difficult to access. Such information is necessary to develop sound conservation and management strategies. Kelps are main habitat-formers in temperate reefs worldwide; however, these habitats are highly sensitive to environmental change. The kelp Ecklonia radiate is the major habitat-forming organism on subtidal reefs in temperate Australia. Here, we provide large-scale ecological data encompassing the latitudinal distribution along the continent of these kelp forests, which is a necessary first step towards quantitative inferences about the effects of climatic change and other stressors on these valuable habitats. We used the Autonomous Underwater Vehicle (AUV) facility of Australia's Integrated Marine Observing System (IMOS) to survey 157,000 m2 of seabed, of which ca 13,000 m2 were used to quantify kelp covers at multiple spatial scales (10-100 m to 100-1,000 km) and depths (15-60 m) across several regions ca 2-6° latitude apart along the East and West coast of Australia. 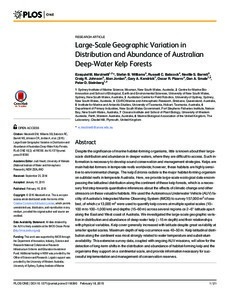 We investigated the large-scale geographic variation in distribution and abundance of deep-water kelp (>15 m depth) and their relationships with physical variables. Kelp cover generally increased with latitude despite great variability at smaller spatial scales. Maximum depth of kelp occurrence was 40-50 m. Kelp latitudinal distribution along the continent was most strongly related to water temperature and substratum availability. This extensive survey data, coupled with ongoing AUV missions, will allow for the detection of long-term shifts in the distribution and abundance of habitat-forming kelp and the organisms they support on a continental scale, and provide information necessary for successful implementation and management of conservation reserves.